After plenty of rumours and speculation, it was finally announced back in November that Amazon had won the $250 million rights to Tolkien's The Lord of the Rings novels and would be adapting the story into a five-season "prequel" series. According to The Hollywood Reporter, Amazon plans to spend $1 billion on the series (including casting, producers, and visual effects), which would make it the most expensive series in TV history. 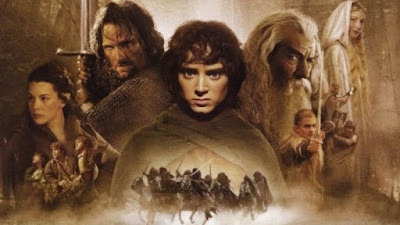 There's no word yet on the content of the series, but given that it's been labelled a "prequel" to The Lord of the Rings and Amazon is working with The Tolkien Estate, they certainly have a lot of material to work with. While The Lord of the Rings and The Hobbit director Sir Peter Jackson played no part in the talks between Amazon and the Tolkien Estate, he is reportedly in talks about his involvement in this series. Other Lord of the Rings alum, however, are not as enthusiastic. John Rhys-Davies, who played Gimli in The Lord of the Rings films, suggested this was more about money than anything. "Why we quite need Lord of the Rings as a TV series baffles me slightly," he said. "I mean, poor Tolkien must be spinning in his grave." Andy Serkis has already said he would pass if approached to reprise his role as Gollum, instead suggesting that a "fresh approach" would be more worthwhile. "I don’t think they will, and nor should they, because I really do think that it’s a wonderful opportunity to tell Tolkien’s incredible story through a long form. If I was putting myself in their shoes, I’d be wanting to create something completely fresh and see the world in a completely different way." "I haven't said yes because I haven't been asked," the actor continued. "But are you suggesting that someone else is going to play it? "Gandalf is over 7000 years old, so I'm not too old [yet]." While there's no scheduled release date yet, part of Amazon's deal requires them to begin production within two years, so it'll be on the way soon! What do you think of this new series? Let me know in the comments below or Tweet me at @TolkienBritta! 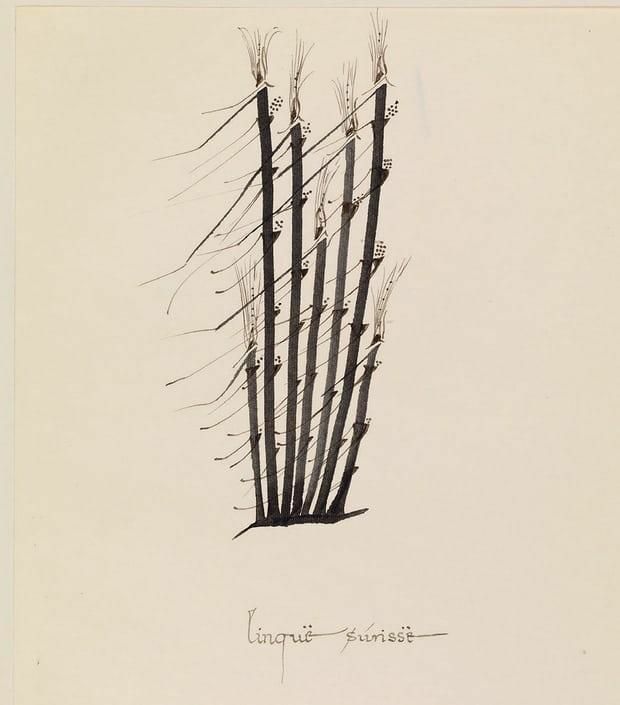 A new Tolkien exhibit at Oxford's Bodleian Library will open this summer and feature a variety of manuscripts, letters, maps, and artwork by the author, including three previously unseen works (including Linquë Súrissë (1960s), which from the Elvish language Quenya translates to "grass in the wind"). 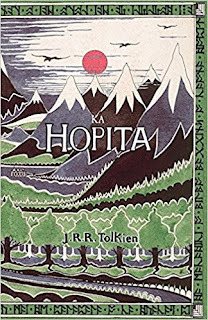 The library will also release a catalog of more than 300 Tolkien materials which will become available in the US in July. "Tolkien: Maker of Middle-earth" will run from 1 June to 28 October. 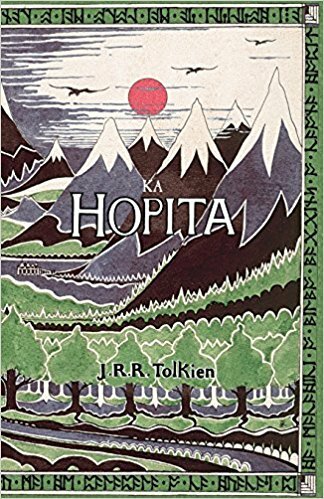 TolkienGuide.com has shared on their webpage that Sushi Books has published a deluxe edition of The Hobbit (O Hobbit) in the minority language of Galician. Check out their post for more information and some neat photos! Additionally, Keao NeSmith has translated it into Hawaiian (Ka Hopita) in an attempt to repopularize the language. You can buy it on Amazon or read more about it on Aljazeera America. 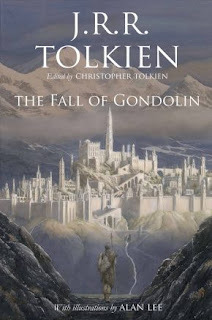 Another new Middle-earth publication is coming out this year! A Middle-earth Traveller: Sketches from Bag End to Mordor will be released on 4 October 2018 by HarperCollins and will feature the artwork of John Howe - who, like Alan Lee, also provided conceptual designs for The Lord of the Rings films. The book is available for pre-order on Amazon UK. Middle-earth has been mapped, Bilbo’s and Frodo’s journeys plotted and measured, but Middle-earth remains a wilderland for all that. The roads as yet untraveled far outnumber those down which Tolkien had time to wander. A Middle-Earth Traveller presents a walking tour of Tolkien’s Middle-earth, visiting not only places central to his stories, but also those just over the hill or beyond the horizon. Events from Tolkien’s books are explored – battles of the different ages that are almost part of legend by the time of The Lord of the Rings; lost kingdoms and ancient myths, as well as those places only hinted at: kingdoms of the far North and lands beyond the seas. 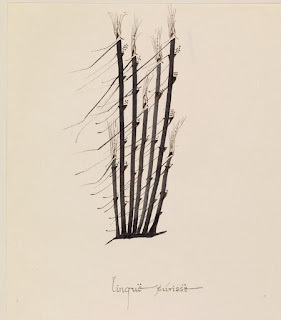 Sketches that have an ‘on-the-spot’ feel to them are interwoven with the artist’s observations gleaned from Tolkien’s books and recollections of his time spent in Middle-earth while working alongside Peter Jackson on the Lord of the Rings and Hobbit film trilogies. 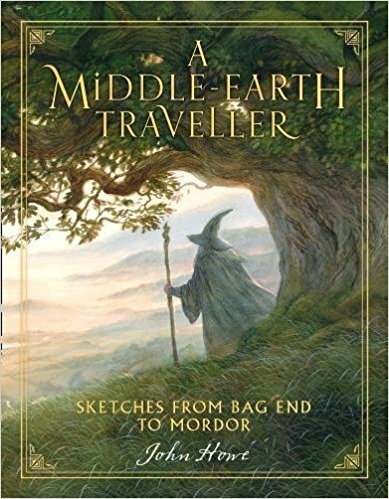 Combining concept work produced for films, existing Middle-earth art and many new paintings and sketches exclusive to this book, A Middle-earth Traveller will take the reader on a unique and unforgettable journey across Tolkien’s magical landscape. If you've been following me on any form of social media, you'll know how fond I am of Tolkien-inspired jewellery. 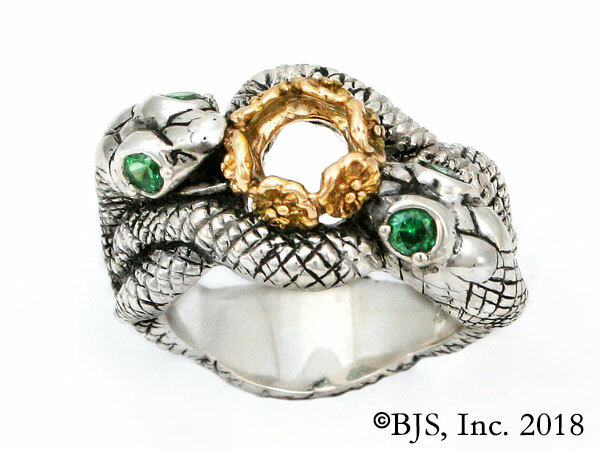 One of the most well-known crafters of Middle-earth jools is Jens Hansen, the creators of the official One Ring of power used in Peter Jackson's The Lord of the Rings and The Hobbit films. In addition to The World's Most Famous Ring, they also offer a variety of stunning Elvish wedding and engagement rings, which I've been browsing for a few months now as I'll probably be in the market for one soon! 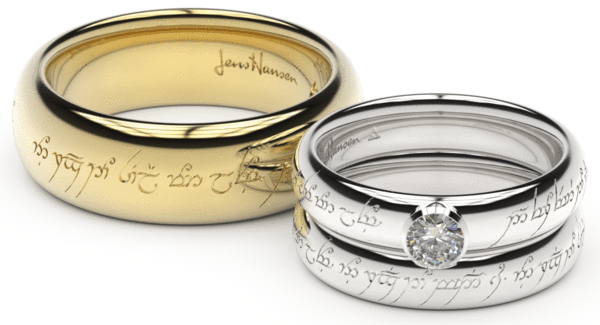 The folks at Jens Hansen will also help you forge your own ring with custom engraving using their nifty English to Elvish Engraving Translator & Elvish Name Generator! Simply visit their Elvish translator page at https://www.jenshansen.com/collections/forge-your-ring, where you'll find a space to input your own text to translate into Elvish, as well as links to other Elvish resources. You can also sign up to receive a free "Elvish 101 in 5 Minutes" how-to guide via e-mail; this includes the basic alphabet and how to write several example names. Even if you're not in the market for a ring right now, the translator is a fun way to see what your name or favourite word or phrase would look like in Elvish. For more information, or to see more products from Jens Hansen, visit their website at JensHansen.com, 'Like' them on Facebook, and follow them on Instagram and Twitter. 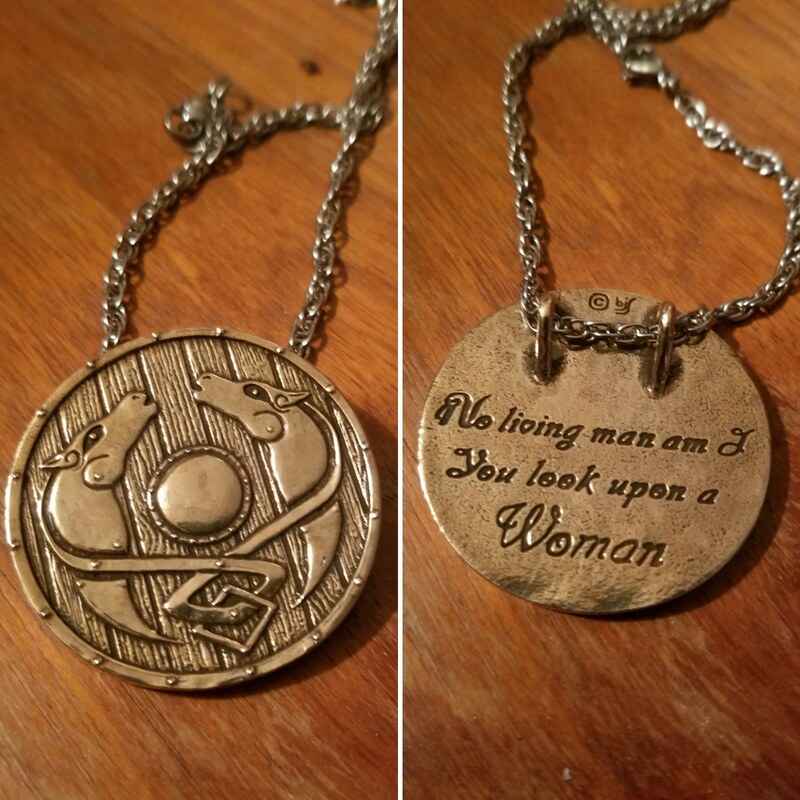 Badali Jewelry's newest Tolkien-themed piece, Eowyn's Shieldmaiden Medallion, debuted back in December and I immediately gifted it to myself. 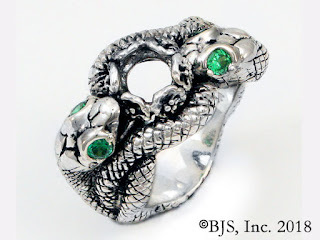 I took a brief social media hiatus after the holidays but have returned with a quick review of what is easily my favorite Badali piece (I know I say that every time, but it just proves how much their craftsmanship improves with each new design). This pendant is the shield carried by Eowyn, featuring two horses of Rohan (one of my favourite motifs) with her famous words to the Witch-king, "No living Man am I, You look upon a Woman" on the backside (again, I just love that their items are inspired by the books and not the films!). It is also treated with an antique finish. As you can see, it's a good-sized medallion; however, it is not unbearably large, nor is it too heavy. I generally shy away from large pieces but I absolutely love this one. I wear a lot of solid colour tunic-style shirts and dresses, and this medallion goes perfectly with them! It's an engaging focal point of any outfit and a great conversation starter. Most people instantly recognise it for what it is. 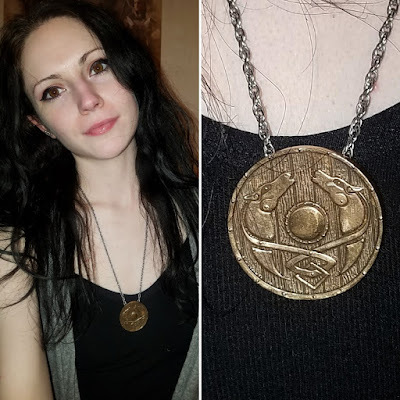 The medallion normally sells for $39.00, but is currently on sale for $31.00. Get yours now at BadaliJewelry.com!